I have always been a fan of face masks, I love the way they make my skin feel, and if you find a good one, how it makes it look too. So in today’s posts I thought I’d share the ones I’ve been loving lately. Note that I have dry and sensitive skin, so although most of the products I list here are good for combination and normal skin too, it might not be the perfect fit for all skin types. I used- and loved this mask when I had a rash on my face caused by a beauty product past a photoshoot. As the product promised to regulate and balance skin, with mineral rich volcanic clay, I thought I’d give it a try. I was pleasantly surprised how calm my skin felt afterwards, and even tho’ it’s clay, it hasn’t dried my skin out at all, which is excellent since I have very dry skin. Find the product HERE. My ultimate favourite at the moment. The way it makes my skin feel is unbelievable. As I mentioned, I struggle with dry skin, and after using this mask, my complexion is looking super radiant, my skin feels soft and hydrated, wonderfully clean, and not to mention firm. Bit pricey, £60, but worth every penny. “Pollution’s dirty secret is that it can enter every pore, every day. Defend your skin with PREVAGE® City Smart Double Action Detox Peel Off Mask. It acts like a liquid magnet to lift and remove impurities instantly while resurfacing skin and enhancing its natural detoxification system. Peel to reveal a brighter, smoother, virtually poreless-looking complexion. “Darlings, forget EVERYTHING you think you know about clay masks! My Goddess Skin Clay Mask features ingredients to tighten pores, moisturise your skin and clear imperfections, with 85%* of users agreeing their skin appears brighter. Now everyone can have flawless, glowing Goddess Skin!” - from the Charlotte Tilbury website. With it’s great reviews all over the beauty blogger atmosphere, I couldn’t have been happier when I received this product. I love the fact that like the Sòley mask, this clay mask doesn’t dry my skin out either but leaving it feeling soft and radiant. 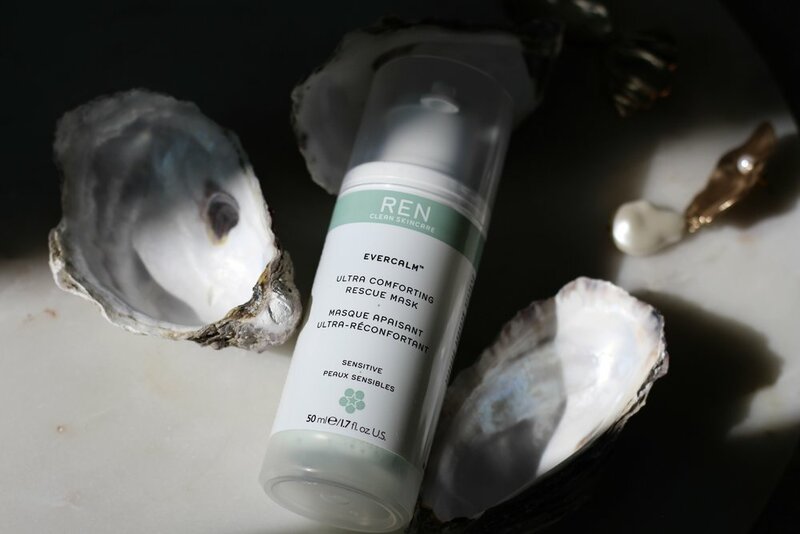 Seeing the whole Evercalm™ range from Ren Skincare is one of our number 1 go-to products, I of course have to mention their face mask. It is so wonderful and gentle, just like the whole range, perfect for sensitive skin that all of us girls at THE 4 OF US struggle with unfortunately. It helps with redness and irritation, leaving your skin feeling nourished and calm.